This is a great summer time recipe when peaches and Nectarines are amazing. For a taste of summer in the winter you can use canned BC peaches and frozen blueberries. Peel and roughly chop peaches (about thumb tip size) place in large bowl. Add chopped red onion, finely minced jalapeno (seeds removed) and chopped cilantro, lime juice, sugar and salt. Mix well and add berries and set aside (you can make this a couple of hours ahead of time if you like). Preheat BBQ. Toss chicken, oil, lemon and salt and pepper in a bowl. 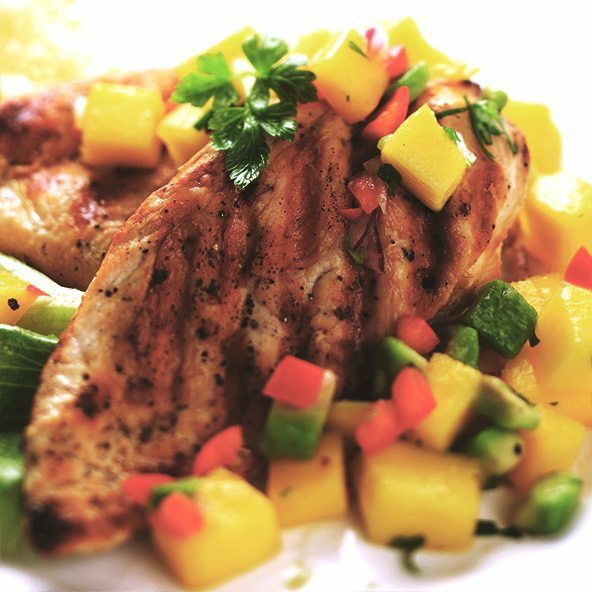 Grill chicken until cooked through and arrange on a serving platter in a flower pattern and spoon salsa in the centre. Garnish with cilantro.